Carson Wentz said Monday that it's his goal to be ready by OTAs. Last year, coming off a knee injury, Carson Wentz declared his goal was to be ready for the start of the Eagles’ season. It turned out he didn’t play until Week 3. So maybe Wentz has decided with this injury that it is better to undersell than oversell. Still, it was mildly concerning Monday to hear the Eagles’ quarterback indicate that the stress fracture in his back is still healing. As the team began its offseason conditioning program, Wentz said that he is “feeling good” but “kind of taking it week-by-week,” as he recovers from the injury that kept him on the sideline for the final three regular-season games in 2018 and for both Eagles playoff contests. He said he is running and throwing. He declined to give further specifics of his recovery. The Eagles have declined to specify when Wentz suffered the injury, but he was on the injury report being treated for back problems in October, though he kept playing through a Dec. 9 loss to Dallas. 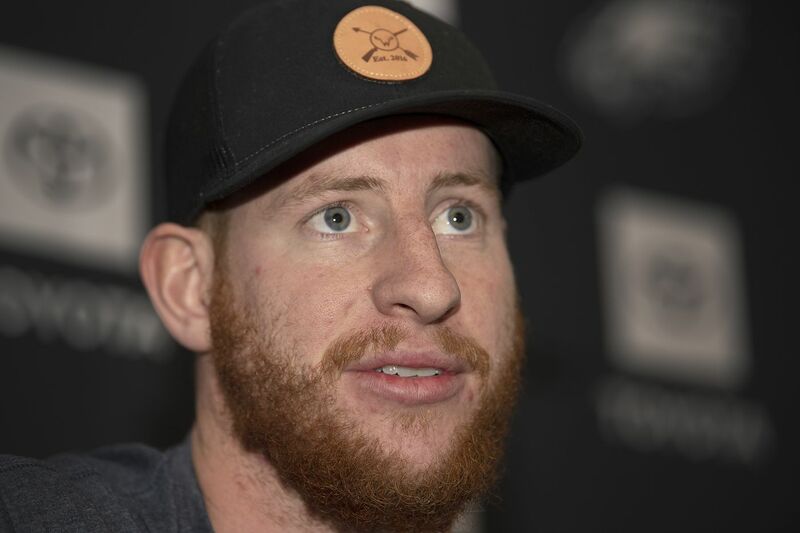 The Eagles never placed Wentz on injured reserve, and head coach Doug Pederson indicated at the time that it would take about three months for the injury to fully heal. That was five months ago. Tight end Zach Ertz, a close friend of the quarterback, was asked Monday if he thought Wentz wanted to prove he can be healthy for 16 games. Ertz said that everyone wants that, but Wentz has no control over injuries. “A broken back, he doesn’t even know when it happened,” Ertz said. Reporters tried to follow up on that assertion, but Ertz backed off, said he “probably overspoke,” and that only Wentz should address when his injury occurred. Wentz spent last offseason rehabbing a torn ACL that caused him to miss the only Super Bowl victory in franchise history. He has said working alone through much of the summer kept him a bit remote from teammates, something he hoped would be different this year. He said it was “exciting” to contemplate a long-term deal with the Eagles, something for which the team seems to be clearing salary-cap space, but he said he is leaving contract matters to his agents at Rep1 Sports. The team has expressed eagerness to lock up Wentz long term as he prepares for his fourth NFL season, something that would seem to indicate little concern over the back problem. He acknowledged that “obviously it’s different” not having Nick Foles in the quarterback room. The QB who led the Eagles to four playoff victories and a Lombardi Trophy during the past two seasons left for Jacksonville in free agency. “That’s also football. There’s always turnover. He’s got an exciting opportunity” with the Jags, Wentz said.